CAREER OPPORTUNITY: Updated July 7, 2017 – We are seeking a part-time Marketing Specialist for PA OUTDOOR JOURNAL. 1) Using our database to call existing and potential advertisers to get additional ads for our state magazine PA Outdoor Journal. Some advertisers have been with us for over 17 years. 2) Because we cover the entire state (and we get some advertisers from out of state), we use the telephone, not face-to-face sales. 3) We are NOT high pressure telemarketers. We want good, long-term relationships with our advertisers, so we act more as facilitators than sales people. We call as a point of contact to see if the business would be interested in an ad, not trying to twist words or outtalk to get an ad. 4) Our database has over 2,000 businesses. Some are existing advertisers, some have advertised in the past, and some have never advertised with us. All these businesses need contacted. As the contacts are made, we will groom the database to keep it current and also be adding new potential advertisers. 5) Because the database is in the cloud, computer use is mandatory. That is how when to contact and what happened with a particular business are found. We also want accuracy and clear communication on all data entries. 6) We offer great flexibility in hours worked. To us, the thing of greatest importance is ad sales—and that these sales are done courteously. 7) More things may pop up than what the basic items listed above portray, but this is the gist of it. 8) We will pay $10 per hour for work in our office and a W-2 at year’s end. We are currently looking for two to three days of five-hours each (10 to 15 hours a week). Days of week and even number of hours a day can be adjusted. This is part time, but can certainly build into full time if that is your desire. 9) If you wish to sell outside our office, that can be arranged at a flat 30% commission of ads sold and a 1099 at year’s end. 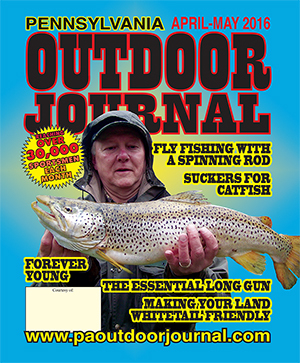 PENNSYLVANIA OUTDOOR JOURNAL is an established business with more than 17 years of service to Pennsylvania hunters and fishermen. Be part of our team!